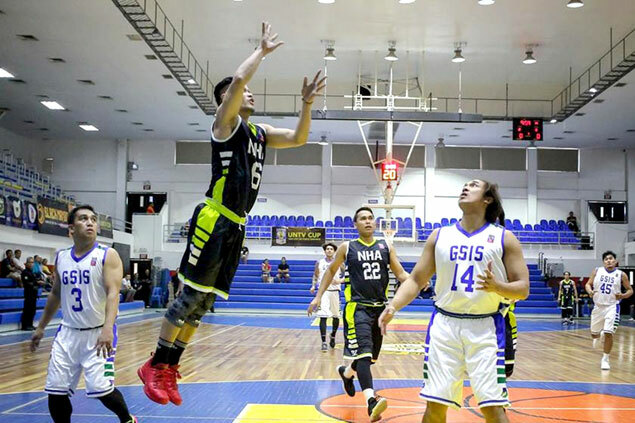 NATIONAL Housing Authority rode a huge second quarter to a 99-88 victory over GSIS Furies, gaining a playoff for an outright semis berth in the 6th UNTV Cup held over the weekend at the Pasig City Sports Center. Down by six points at the end of the first quarter, the NHA Builders exploded for 35 points in the next frame behind the sniping of Antonio Lustestica and Alvin Vitug to build a 56-49 lead which they wisely protected to finish the second round with an 8-2 record. Six NHA players scored in double figures, with Lustestica delivering 27 points, Vitug chipping in 17 and John Dizon adding 16 as the Builders foiled the Furies’ own bid for an automatic semis berth in the tournament organized by UNTV president and CEO Daniel Razon. “We started flat but good thing the boys recovered their form,” said NHA coach Benet Palad. Malacañang-Philippine Sports Commission also boosted its semis bid with a thrilling 63-59 win over Senate, while defending champion Philippine National Police crushed Judiciary, 90-57. Christian Luanzon led a balanced Malacañang attack with 14 points as the Kamao improved to 7-2 while handing the Senate Defenders their third defeat in nine matches. The PNP Responders are no longer in the running for an outright semis berth but with their win – their fifth in nine games – they are assured of a better position in the quarterfinals. The chosen charity of the champion team gets P4 million in the tournament for public servants.